Xona Games, a talented and award-winning team creating some of the most critically-acclaimed indie arcade games to date, has announced its two newest offerings to the gaming world at large: Decimation X3 and Score Rush. Both titles will be launching on the Microsoft Xbox LIVE Indie Games platform with Decimation X3 going live on Tuesday, December 7 and Score Rush on Thursday, December 9, and both will be available for purchase for 80 Microsoft Points ($1 USD). Decimation X3 has been selected as part of the Indie Games Winter Uprising, a week-long celebration of the best that Xbox LIVE Indie Games have to offer. Orchestrated by a group of fellow developers longing to promote the higher-quality games that can be found on the platform, the Indie Winter Games Uprising takes place the first week of December and features 12 top-tier games that they hope will elevate the impression of the Indie Games channel. 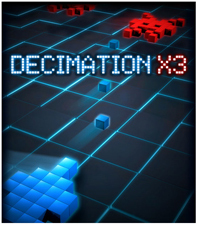 Decimation X3 is the thrilling sequel to one of the most popular 2D-retro shooters on Xbox LIVE Indie Games, Decimation X, which is one of the top-rated Indie Games in Japan (currently #2 out of approximately 1,500). Get ready for intense, never-ending waves of enemies and a continual rain of power-ups to significantly improve your offensive and defensive capabilities. Featuring decidedly retro pixel art graphics, an overload of explosion particle effects, 60 frames per second and a hypnotic trance beat soundtrack from Imphenzia, Decimation X3 is everything an arcade junkie could wish for and will put your reflexes to the ultimate test. The spiritual prequel to Duality ZF and built upon the same engine that was a semi-finalist for technical excellence in the 3rd Independent Game Developer’s Competition, Score Rush is an intense 2D, four-player, dual-stick, bullet-hell, score-running shooter. It features unlockable difficulty modes, several mid-bosses and bosses, and tons of smaller enemies. It is visually intense with a hard rocking soundtrack created by Dragon Music Productions. Collect both types of power-ups – those that upgrade the main weapon and those that add deadly appendages to your ship – to rack up insane scores. The bigger the enemies are and the faster you kill them, the more points you get. 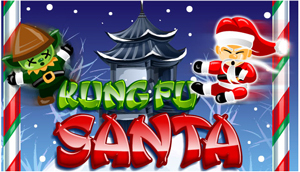 Just in time for the holiday season, Toronto developer Big Bad Brush Inc. has announced the launch of their much anticipated second game, Kung Fu Santa, which is available now for the iPhone, iPod and iPad. Kung Fu Santa is a unique concept with a fun factor of 100! This arcade style game features game center and retina display capabilities. Playing as the kung fu master himself, the user will have to jump between moving candy cane poles and save all the presents, while avoiding dangers such as poison goo, bombs, and evil elves! The evil elves have stolen all of Kung Fu Santa’s presents and plans to sell them all for money. Greedy little things aren’t they? But alas, Kung Fu Santa is here with his superior Kung Fu moves! * Collect presents and fill up Christmas bag! * Avoid dangers and stop Evil Elves! EA Mobile™, Harmonix Music Systems Inc. and MTV Games have announced that Rock Band™ Reloaded is now available on the App Store. The iPad™-exclusive HD version and the version for iPhone® and iPod touch® offers players an initial powerhouse set list of songs from artists including Nirvana, Billy Idol, No Doubt, Nine Inch Nails and Vampire Weekend. More than 20 songs will be available today with new tracks launching throughout the holidays. Plus, for the first time, Rock Band Reloaded players now have a “5th Way to Play” by singing directly into their iPhone, iPod touch and iPad utilizing new vocal recognition features. New vocal recognition features introduce players to a unique way to play by singing directly into their iPhone, iPod touch or iPad to earn points. Players can showcase their inner rock star by picking from a setlist of songs that include “Hella Good” by No Doubt, “Kryptonite” by 3 Doors Down, “Your Decision” by Alice in Chains, “White Wedding” by Billy Idol, “In Bloom” by Nirvana, “A-Punk” by Vampire Weekend and many more. In addition to the songs included with the initial purchase, free (internet connection required. Data rates may apply) tracks are available in the Music Store along with Premium Packs by The All American Rejects, Third Eye Blind, Blink-182 and other top-selling artists available through In App Purchase. 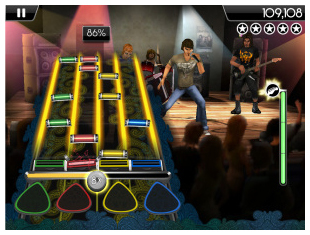 For the first time on iPad, Rock Band Reloaded packs delivers device-exclusive features including a Multiplayer mode where players can challenge friends live in a head-to-head split-screen environment. Flexible controls provide for ultimate customization of all play styles. The iPad game’s new “Big Drums” layout increases the interactivity of this fan-favorite instrument. Songs are now more accessible to players with custom playlists in Quick Play and quick replay using an “Encore” feature. PadWorx Digital Media, Inc. is pleased to announce that you can now come face to face with a revolutionary new vision of Ebenezer Scrooge and the ghosts of Christmases Past, Present, and Future in the most immersive edition ever of Charles Dickens’ timeless classic A Christmas Carol, available now in the iPad App Store for $4.99 USD – a portion of which will be donated to charity. Through 130 pages of lovingly abridged text, readers will help power the story forward. Whether turning the key in Scrooge’s door and watching as the door knocker changes into the deceased Jacob Marley, powering up and manipulating an assortment of wonderful steam powered devices, or just marveling at each chapter’s ‘mechanical‘ page-turning contraptions, A Christmas Carol for iPad’s animations, illustrations, original score, and sound effects will draw you into the story’s unforgettable lessons of darkness, despair, joy and life. 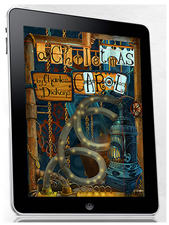 As with PadWorx’s debut title Dracula: The Official Stoker Family Edition, A Christmas Carol for iPad includes hidden Easter eggs of bonus content: the complete 1910 silent movie version of A Christmas Carol by Thomas Edison Studios as well as the full 1938 Orson Welles radio adaptation of the holiday tale – and is fully endorsed by the Dickens family. This entry was posted on Thursday, December 2nd, 2010 at 12:15 pm and is filed under Casual, Digital Products, Everyone, Everyone 10+, Mobile, Music, National News, New Releases, Platform, Shooters, Simulations, Upcoming Releases. You can follow any responses to this entry through the RSS 2.0 feed. You can leave a response, or trackback from your own site.